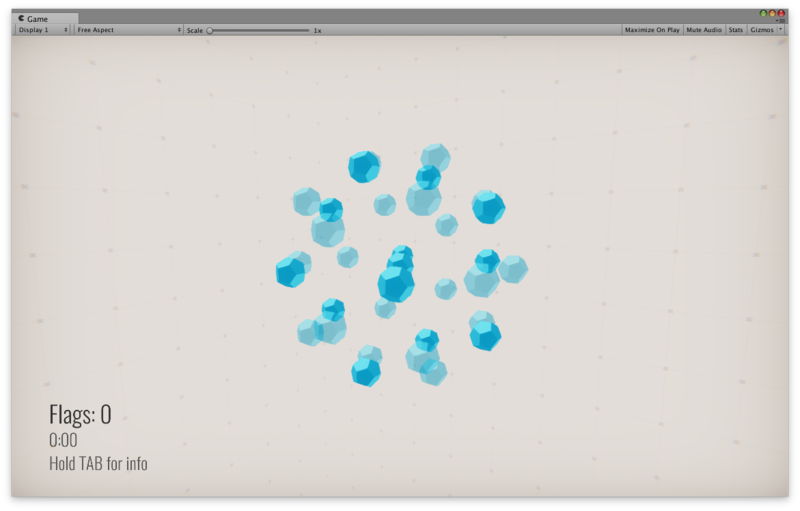 Exploring a core concept of 3D Minesweeper to prevent overwhelming players with information. Posted in the 3D Minesweeper project. A major issue learned while playtesting 3DMS was players had an issue mentally connecting all the attached nodes when examining a region. For instance, the a square node at the center of a 3x3x3 grid has 26 node connections. This is a lot to expect the user to manage, especially when considering the amount of information the player must remember regarding the neighboring contexts, as well. This visually demonstrates the ‘adjacent’ nodes for the current selection. In the above video, we can see that visual isolation greatly helps the player focus on the immediate playing area. The issue, though, is the neighboring contexts. A block with a 6 count on the edge of a context means the player must switch between two (or more) contexts in order to determine the information they need to make a move. This not only makes for boring gameplay, but the game is also inherently difficult. Boring + difficult = no good. When I refer to ‘contexts’, I’m speaking about the immediately adjacent area surrounding a node. A “neighboring context” would be the surrounding nodes of a neighboring point. Essentially, each possible ‘section’ is considered a context. After some playtesting and gathering player feedback, I had a problem: the game was too hard. Across the board, players mention the difficulty in tracking what nodes are connected. Some suggest drawing lines to denote connections, which I consider. 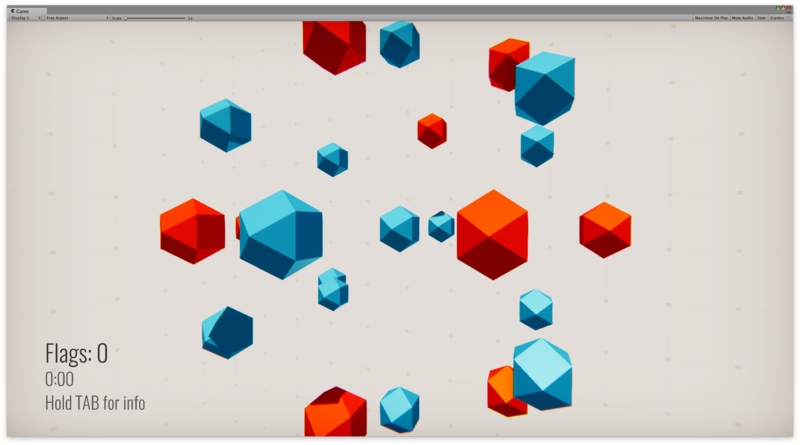 After kicking around a few options, I decided to explore an idea surrounding the nodes’ 3D faces. My experiment was simple: it’s hard to visually identify which nodes are connected, so what if the nodes themselves could indicate their connections? Here, we see a dodecahedron (12-sided 3D solid) surrounded by other dodecs. 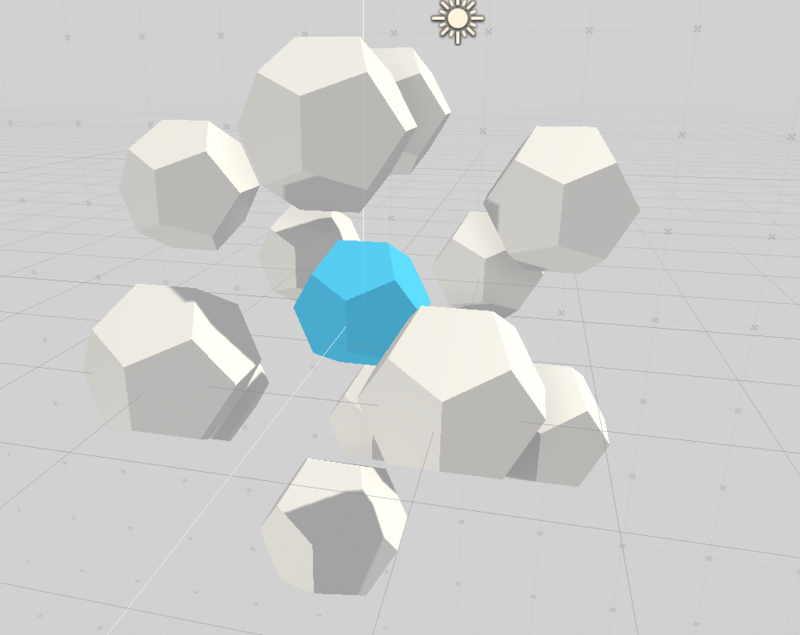 What’s happening here is the central node spawns new nodes based on the normals of each of its faces. 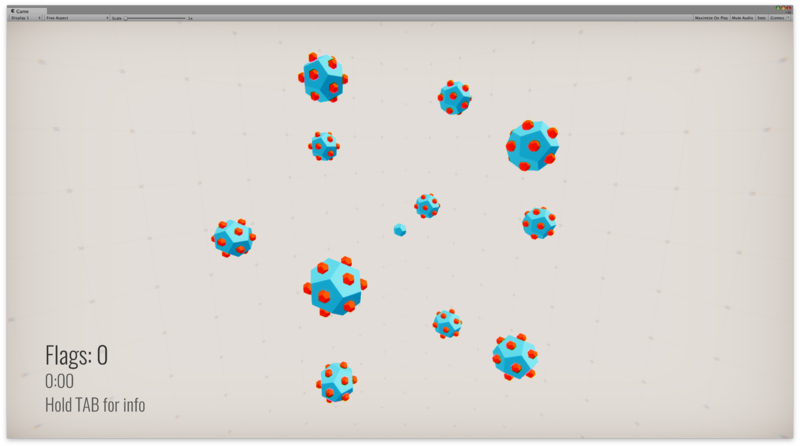 Basically, it finds where each face is looking, and then spawns a node there. This is how connections are created and visually established by the player. Each node face is looking at one of the neighbors of that node. Here, connections to the central node are highlighted orange. While visually it seems a bit clearer, that’s simply due to the fact there are fewer elements on screen. It’s very difficult to determine which nodes are connected, even with the connection nodes highlighted. No, really, we’re done here. I assure you, there is no need to continue. I think this is an interesting setup to consider. Perhaps the user has to solve each node’s “surface nodes” before being allowed to unlock the node? Maybe it’s some sort of recursive nightmare where there are ALWAYS subnodes to solve? I’m not sure. My thoughts on this start wandering into mechanics that aren’t necessarily “3D Minesweeper,” but maybe that’s not a bad thing. We will see. This was an interesting experiment, and I don’t feel like it’s quite over. I’m doubtful as to whether this particular mechanic is suitable for MineSweeper, but I definitely feel there is potential there to some degree. One key issue that this approach doesn’t solve is the fact that the player must take into account the neighboring contexts while in-game. Perhaps there needs to be a bit more overt “HEY THIS IS CONNECTED TO THAT” signalling in the game, but that’s an experiment for another time.